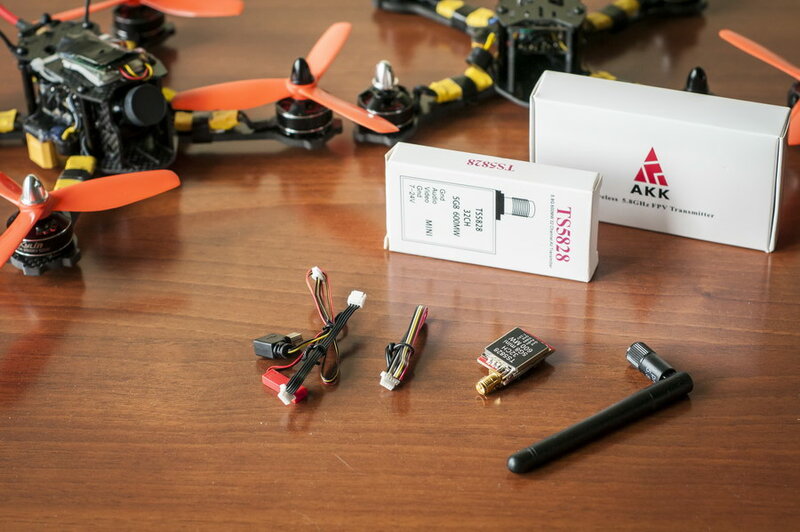 Today, we have another 4 FPV products from fastly emerging AKK Tech company for test and review. We have already reviewed couple of products from this brand recently (micro FPV cam + transmitter / set of FPV antennas) and found those to be very good perfromers considering price to performance ratio. Therefore, conducting further tests for some other components we have here today would prove us either right or wrong about our positive attitude towards this company. Let’s move along and jump into the action! Camera comes in a small box with special mounting bracket, 4 screws, camera cable leads, OSD control joystic and power supply leads and English manual. 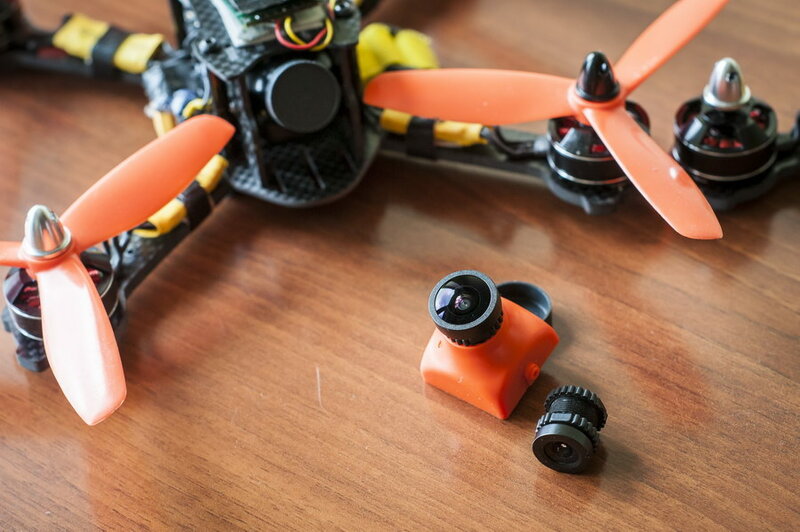 CA20 is wery well built FPV camera that looks very familiar if you happen to use Foxeer XAT600M before. The same size, shape, weight and cable lead connector at the upper left corner on the back. As the matter of fact — all features and specification are also identical. It comes with 2.8mm M12x0.5 thread lens with ~115° FOV from the factory which I would change to 2.5mm with ~130° FOV right away because this is my most preferred angle for FPV flying. This camera is built on very common pair: 1/3” Sony SUPER HAD II CCD sensor and Nextchip 2040 DSP that deliver perfect performance for FPV use. Camera is widely controlled through OSD settings and the resulting picture quality is perfect in terms of danymic range, auto white balance and smooth exposure compensation. Moreover, it is perfectly usable under low light conditions. 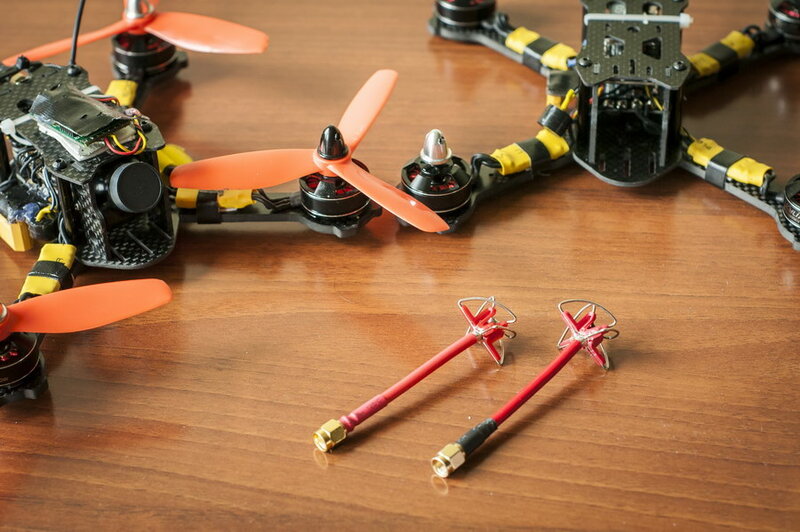 Such functions like wide dynamic (WDR) or even digitally controlled wide dynamic range (DWDR) optimizers are very suitable and doing a good job on keeping the entire frame with large bright-to-dark area difference more or less evenly lit which is very good for any FPV pilot. OSD menu walkover for this camera can be found in my review video. It looks being almost the same to Foxeer XAT600M OSD and has a plenty of control for different camera functions. The main are picture adjustments in terms of saturation, contrast, brightness and sharpness and some additional settings like DWDR, WDR. You can play with it to tune the picture quality to your liking. OSD control joystick comes in the box. Video transmitter, set of connection cables and English user manual. One of the most interestion items in AKK products lineup. This transmitter has 2 versions: with a pigtale and with SMA connector soldered directly to the board. But both share the same features: 40CH and 25, 200, 600mW switchable + ON|OFF switch. This would allow you to judge which power output to use depending on the flight conditions and to avoid transmitter overheating or|and distructing other pilots with power OFF state while waiting for your turn to fly. It is small and lightweight. LED indicator and single button to control all functions. Controls are easy — short button press to change channel, longer button press to change group and 15 seconds button press to change power output and to switch ON|OFF. The build quality is also great. All soldering is neatly accoplished and covered with the heatsink. As seen from our testing video — X1P is the winner in this comparison. It delivers excellent picture quality, handles the signla better and has almost no frame losses during my test travel. Expecially this is true for 200mW output setting. 600mW would be a bit worse in the test when I walk around the house. Why is it so? Because such conditions have many obstacles to reflect the signal and make it interfere with the signal following the direct path. Therefore, the higher the output of a transmitter -> more strong reflections -> more direct to reflected signal interference -> picture is worse. Such testing conditions would always require some less but adequately powerful transmitters to produce better results. That is why in this test 200mW setting for X1P is showing better result. And viseversa for the open field (flight) test in my video. X1P still does the better job than my Kylin 600mW transmitter but only when set to 600mW. Here we do not have much of reflected signal coming in and the direct signal strength is what really matters. So, X1P not only have some superior functionality but also outperforms all other transmitters in my test. Very good product with a good price. Excellent value for money. 32channels: Covers A, B, E, F bands. Comes with a set of GoPRO connection cables with power, a set of other camera connection cable leads, omnidirectional antenna and English user manual. This is a classic-type small and lightweight video transmaitter that is controlled with a dip-switches on the board. All channels and frequecies are stated at the back of the box and in user manual. Easy to operate but is less handy to control if it would be situated deep inside your model. Build quality is nothing to worry about — very neat. TS5828 show some similar results to my KDS Kylin 600mW transmitter that I am using for more than 1 year now and which has never let me down — thus, would be 100% enough to use. But, as clearly shown in our testing video — it falls short to X1P performance. Which means that X1P would be more versatile to use. Anyway, the price difference also matters and TS5828 is an excellent choice for the tight budget. It performs well, stays reasonably cool, costs less and can compete with many others rivals with the same or sligtly higher cost. Comes as a set of 1 RCPL/LCPL RP-SMA and 1 RCPL/LCPL SMA antenna. This particular design of antennas is believed to be originate from Aomway. Moreover, Aomway of this type would outperform most of all other antenna designs currently availbale on the market. This has been proven by many youtube videos where Aomway antennas of this type were compared to many other types and designs and Aomway would either be a winner or at least not worse than a winner. Considering the fact that AKK LR2 set is perfectly crafted and looks exactly the same as Aomway — seems that it should deliver the same perfect performance. Our testing video clearly shows that — I have tested Aomway and AKK LR2 antennas on the same AKK TS5828 600mW transmitter under the same conditions. And they perform very similar, as expected. So, considering that AKK LR2 cost less than the same antennas produced by Aomway — I would stick to AKK products to save some amount for other equipment. 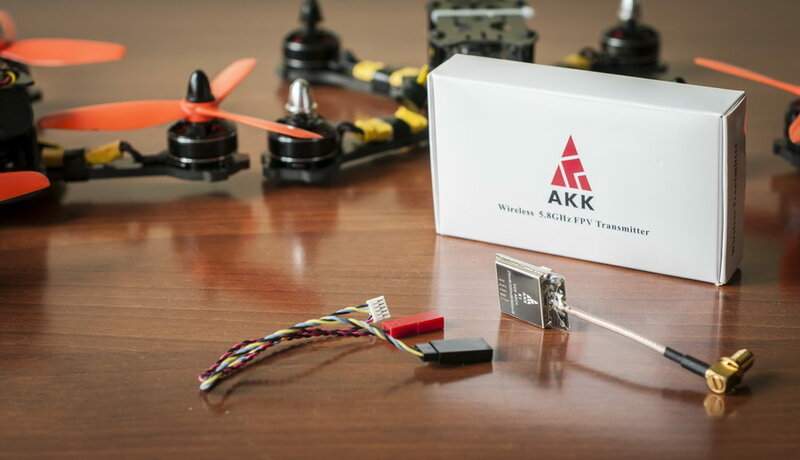 We like that fact that there is a new name on FPV equipment market — AKK Tech — that delivers very good products at lower cost. We have already tested 6 different items (4 now and 2 previously) and found that most of them outperform their rivals with the same price while the rest of the products are just equal to well known brands. This lets us think that AKK would aquire their client base very quickly and continue to expand as long as the price to performace ratio of all of their products would stay at the current excellent ot better-than-average level. Good news here for international customers: AKK Tech notified us that they have launched their new online store at AliExpress (free shipping terms). HERE. Customers from USA might find it more convenient to use AKK corner at Amazon. HERE. Last edited by Datos; Apr 25, 2017 at 11:22 AM. Been asked several times why the TS5828 picture is so different in the video. It is because I was using GoPRO-like camera to connect to TS5828 in this test instead of FPV cameras. But I've compared the quality of the signal, not the quality of the picture - therefore, it doesn't matter for a test. Second: all transmitters were powered by 4S in all tests. Have 2 X1 Vtx's and both are having the same issues on two different planes. More than likely you're getting electrical interference from the ESC and motor. You might try an LC filter.